The title of this post is the same as that of this article on Global Construction Review. This is the first two paragraphs. A row has broken out over a decision to cancel a direct rail link between Glasgow Airport and the town of Paisely, just east of Glasgow, in favour of exploring a self-driving transportation pod system. The direct rail link was announced as part of a £1.1bn investment in the Glasgow City Region deal agreed in 2014 and was expected to be operational by 2025. I am not sure, which system I prefer, but then I’m a rather different type of airport traveller. I rarely have anything more than a man-bag and a small hold-all. I want convenience and can easily walk up to a kilometre with my hold-all. I only fly Ryanair as an airline of last resort. But what annoys me most, is if to get to the Airport, I have to scratch around buying a ticket for the link from the station to the Airport. At all London Airports, except Luton, you buy a ticket to the airport station or use a contactless card. Luton is introducing an automated shuttle between the airport and Luton Airport Parkway station and if it is not free, I’ll never use the airport. Edinburgh and Manchester Airports have tram links between the Airport and the City Centre, so I can’t see any problems with a tram-train link, that instead of dropping you on the street in the City Centre, as a tram would do, drops you in a railway station. The way Manchester is thinking about tram-trains, I wouldn’t be surprised to see them at Manchester Airport. Based on what I have seen in Sheffield, I don’t believe there would be any serious problems developing a tram-train link to Glasgow Airport.. However, these could be issues. Is there enough spare capacity on the Inverclyde Line? The tram-train link would go to Paisley Gilmore Street and Glasgow Central stations, but what if your local train service to Glasgow goes to Glasgow Queen Street station. Would many people still use their cars to get to the Airport? I wrote about the proposed pod system for Glasgow Airport in An Innovative Scheme For A Rail Link To Glasgow Airport. It has its plus points, but I worry that getting the right number of pods to provide a good service might be tricky. Glasgow’s problem is that both these links connect into the centre of Glasgow at Glasgow Central station. So if your connection to Glasgow comes into Glasgow Queen Street station, you will have to hump your bags across the City Centre. A plan has existed for years to create Crossrail Glasgow, which would make matters easier. But nothing has so far been decided. There is no point in building any form of link to Glasgow Airport, unless Crossrail Glasgow is built. Otherwise, passengers with an indirect route to Glasgow Central station will still drive or avoid the airport entirely. I arranged my trip through Glasgow so that I arrived in Glasgow Queen Street station around lunchtime, so that I could have lunch at a restaurant on my way to Glasgow Central station. I took the side entrance to Queen Street station and walked to West Nile Street, where I had lunch in Gourmet Burger Kitchen. From the restaurant, I continued down West Nile Street, before turning right for Glasgow Central station. This Google Map shows the two stations and the area in between. There’s probably a cafe or restaurant to suit everybody on the walking route. Walking the way I did was slightly down hill and parts were in pedestrianised streets. 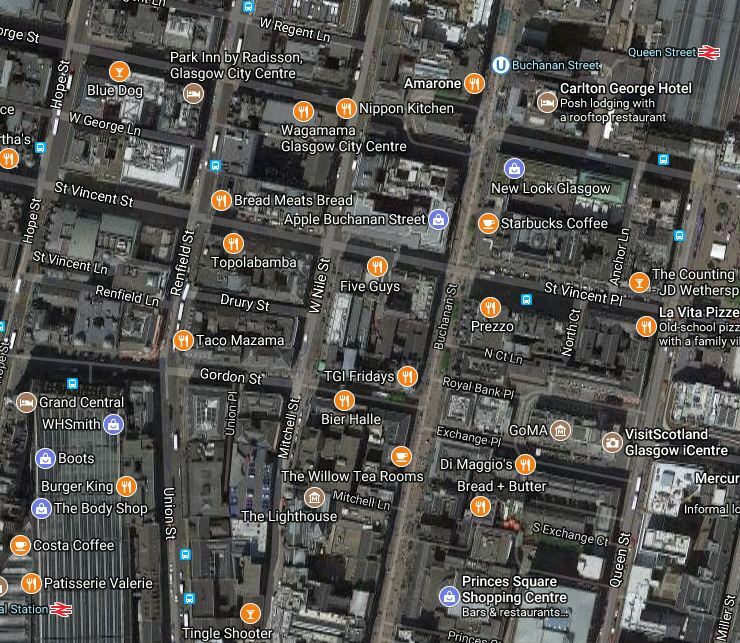 I know Glasgow’s two main stations fairly well, but there should be a signposted walking route. TransPennine Express are replacing their Class 350 trains with new Class 397 trains. So coming down from Glasgow to Carlisle, I took one of the Class 350 trains to see why they are being replaced. The train that I rode, had been spruced up with the new livery. The new Class 397 train has the following advantages over the Class 350 train. It will be a 125 mph train rather than a 110 mph train. It will be five-cars instead of four-cars. Will there be any other passenger features like a buffet? This article in Rail Technology Magazine is entitled Network Rail awards Carillion £49m Shotts electrification contract. Network Rail has agreed a contract with Carillion Powerlines Ltd to deliver the electrification of the Shotts Line between Holytown Junction and Midcalder Junction. The £49m contract will see the delivery of 74km of electrified railway as part of the Scottish government’s wider £169m investment in the line between Edinburgh and Glasgow. Electrification of The Schotts Line will provide a fourth electrified line between Edinburgh and Glasgow. From hundreds of miles to the South, it looks a good choice. The route is effectively in three sections, with only the central section between Holytown Junction and Midcalder Junction, needing to be wired. The bridges that need to be raised are already being worked on. The route goes to Glasgow Central rather than Glasgow Queen Street. The Class 385 trains needed are already being built in Newtown Aycliffe. It certainly seems that the planning of electrification in the Scottish Lowlands is being better managed that that on the Great Western Railway. This article on the BBC is entitled Plans for direct tram-train link between Glasgow Airport and city. This is the three opening paragraphs. Plans to create a “tram-train” link between Glasgow Airport and the city centre have been unveiled. The £144m Glasgow Airport Access Project could see journey times cut to 16.5 minutes and would bypass the need to use the busy M8. It would involve a specially-designed hybrid tram-train using the existing railway network and on-street tracks. That sounds like a sensible plan. What Is A Hybrid Tram-Train? As I said in Were The New Merseyrail Trains Designed In A South London Pub?, I believe that Stadler have designed a rail vehicle, that can. Be equipped to run on any of the electrified rail lines in the UK. Run as a train on heavy rail lines such as that between Glasgow Central and Paisley St. James stations, where it would use 25 kVAC overhead electrification. Run as a tram on a dedicated tram track to the Airport, built without electrification, using onboard energy storage charged on the journey on the electrified line between Glasgow and Paisley. Provide step-free access by making sure that the trains fit the platforms, which would all be built to the same height. I believe that the trains could be a version of those that Stadler are building for Merseyrail. After all, the Swiss company are already building special trains for the Glasgow Subway. As it takes about sixteen minutes between Glasgow Central and Paisley St. James stations., one train would probably provide an hourly service. But obviously, things do go wrong, so at least two trains would be needed, with one as a spare or in maintenance. Two trains could provide two trains per hour (tph), with four trains needed to provide 4 tph. Merseyrail is paying £9million for each similar four-car train, which includes extras like maintenance. The only differences would be. Glasgow’s trains would be 25 kVAC trains, whereas Merseyrail’s are 750 VDC third-rail trains. Interior fit and colour scheme. Note that Stadler have said that the Merseyrail trains can have 25 KVAC equipment and batteries fitted. I would buy five trains to provide a four tph service, with one as a spare or in maintenance. This would leave around £100million for the only new infrastructure, which will be a rail spur to the airport from the West of Paisley St. James station station on the Inverclyde Line. This spur could be built along the following lines. On-street or dedicated fenced off track. Simple stations like the tram stops in Birmingham, Croydon, Edinburgh or Nottingham. I think a single-track bi-directional track would work, but space should probably be left for double track, if it proves very popular. It might be better to think of the rail spur as a long well-landscaped siding, which just happens to end within a few metres from an airport terminal. I think that this link could be built inside the allocated budget of £144million. Note that if this works for Glasgow, what about Bristol, Cardiff, East Midlands and Leeds/Bradford and Liverpool Airports? This article on the BBC is entitled Leeds Bradford Airport railway station one of three planned. The proposed new station about one mile (1.6km) from the airport would also act as a park and ride for commuters to Leeds and Harrogate. I wonder if the trains at Leeds/Bradford Airport will go the last mile? It would need the Leeds-Harrogate Line to be electrified, but it would give the Airport the high-class rail link it needs. I believe that Merseyrail’s new trains, have the capability to serve Liverpool Airport in the same manner, in which the Glasgow Airport Rail Link could be built and operated. There are more details here in Thoughts On Merseyrail’s New Trains. Stadler will sell a lot of these trains to provide links into places like airports and town-centres. These pictures show my second trip to Wemyss bay station with its ferry terminal. The buildings were designed by the architect; James Miller. You might ask why this was my second visit to Wemyss Bay. In the 1960s, I caqme up to see Spurs play Glasgow Celtic at Hampden Park in what was a pre-season Glasgow Cup. I’d arrived early in the morning, after hitching a lift from Gretna in a van that had been delivering newspapers. So for some reason, I took the brand-new Blue Train to Wemyss Bay station and slept for an hour or so on the beach. Glasgow Central Station is one of the buildings by the architect; James Miller. The station appears to be larger than Queen Street station, with more space and seats. It could do with a few more tickets machines though. On Saturday, I was staying at Stirling near to the station and wanted to get to Glasgow to have a look at the closure of Queen Street station, for upgrading Queen Street Tunnel, platform lengthening and electrification work. This article on Network Rail’s web site, which is entitled Glasgow Queen Street Tunnel upgrade, says this. The work is starting just before the Easter bank holiday weekend, and lasting much longer, with a 20-week closure of the high-level Glasgow Queen Street Tunnel from Sunday 20 March to Monday 8 August so that the concrete slab track inside the tunnel can be renewed safely. It’s the largest piece of engineering on the Edinburgh to Glasgow line since the railway was built. Renewing more than 1,800 metres of slab will mean 10,000 tonnes of existing concrete slab will be removed, as well as 4,000 metres of new rails laid, and more than 150 staff will be working on the project every day during the 140-day period. A lot of other work will also be done at the same time. So Network Rail and Scotrail have called up the spirit of Baldrick, and devised a cunning plan. This map shows the rail lines in the Glasgow area. My route in from Stirling to the low-level platform at Queen Street was something like. Coming back from Glasgow Central, the route was something like. Although the train didn’t stop until Stirling. And these were taken on the way out. It certainly seems there are more wayus of moving trains through Glasgow, than most other cities. You almost wonder looking at these pictures and the routes that I took, that Network Rail and Scotrail have an alternative philosophy. Most platforms seem to have been lengthened to at least eight cars, which mean they’ll handle two Class 385 trains coupled together. Most of the lines through Glasgow seem to either be electrified or seem to be having wires installed. It should be noted that the route I took back to Stirling, would also enable a service to be run from Carlisle to Perth via Motherwell, Coatbridge, Cumbernauld and Stirling. Once, the TransPennine routes are electrified, Manchester to Edinburgh can go up the East Coast. Are Network Rail going to apply some of the innovative interchange philosophy I wrote about in Better East-West Train Services Across Suffolk? If electric trains can get everywhere and they are twice the capacity of the current diesel trains, then mathematics and scheduling rules, says you can get more trains through the system. 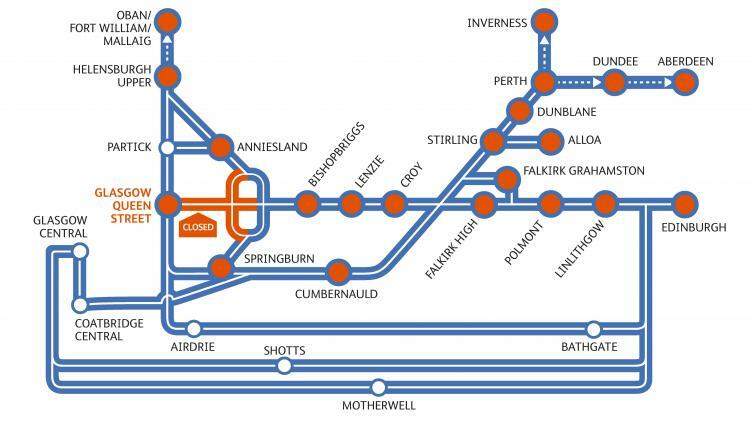 So could they be looking to increase the capacity of the two Glasgow stations and open up circular routes between them? I don’t know the answer, but I do believe that when the EGIP program is complete, it will be interesting to see if more passengers are able to use the trains. What is being done is very different to previous proposals.